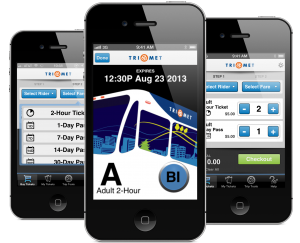 The TriMet Tickets mobile ticketing app has hit a new milestone: 50,000 downloads of the app. Riders have used the app to purchase more than 331,000 mobile tickets since the free ticket app launched in early September. The app allows you to buy fares right on your smartphone – anywhere, anytime. The mobile tickets are then stored in your phone for use with a few taps of the screen. Go to the Apple iTunes or Google Play store and download the free app to your iPhone or Android phone. Go into the app and register your account. Go to the “Buy Tickets” tab and select your rider group and the fare you want, and then tap “Checkout. Enter or confirm the payment card you want to use. It’s that simple! We have easy to follow how to videos at trimet.org/mobiletickets/howto. Purchase mobile tickets ahead of time and then validate them when you need to use them. If you use 2-hour tickets or day passes, consider purchasing a handful at a time for use when needed. Due to credit card processing fees, the app requires a $5 minimum purchase anyway, but again you can purchase multiple tickets and validate them as needed. The $5 minimum purchase doesn’t mean you have to buy a $5 ticket. Validate or launch your ticket before entering a fare-required rail platform or before boarding your bus or train. To make sure your mobile ticket loads in time, launch it when you see your bus or train approaching. Remember, you are required to show a fare when riding TriMet so make sure you validate your ticket, and make sure your phone’s battery won’t run out during your ride. When you first download the app, register your account. This allows you better control of the tickets you purchase, which are automatically stored inside the app on your phone. Before making any changes to your phone that might cause your app to delete or reinstall, move your unused tickets from your phone to your online account at trimet.org/mobiletickets or else they will be lost. Just go into your online account and click the “My Tickets” tab and ‘recall’ your unused tickets. Get more helpful technical tips at trimet.transitsherpa.com. 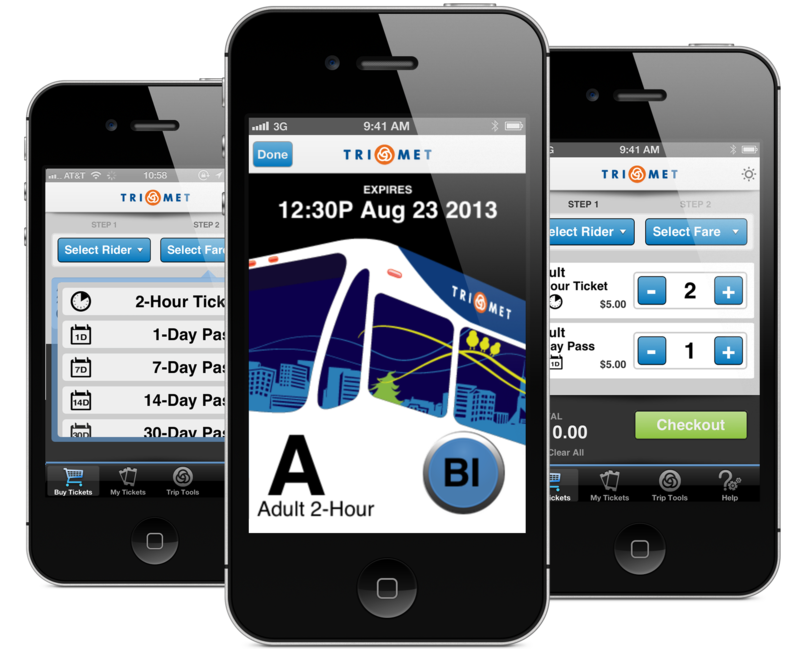 TriMet partnered with local software developer GlobeSherpa to create the app, the first to be used in the U.S. for riding both buses and trains. Learn more information about the TriMet Tickets app at trimet.org/mobiletickets.